I had plans of planting a sunflower patch this summer. Like so many other plans they didn't get put into place. At least I have your lovely pictures to enjoy. 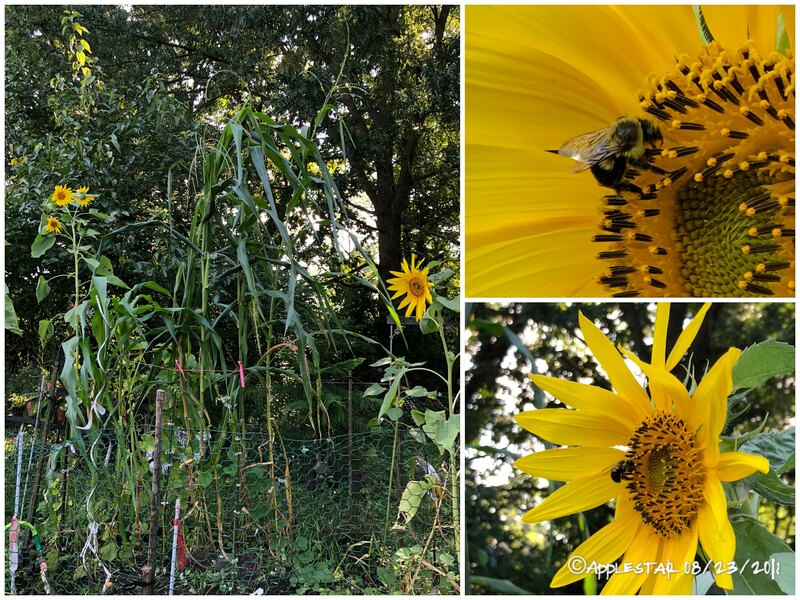 I have a small patch of perennial sunflowers that are now blooming. I though I had dug them all up (gave some away, sold some for some decent $$$) and am really glad to have these few still. The flowers are not very big and they don't produce very many seeds but they are all I have this year. Not as impressive this year, but the bees and butterflies are enjoying them, and soon the squirrels, chipmunks, and the birds will, too. Beauty! Looks like a big one. Is it a named variety? Volunteer bird seed sunflower, the typical black striped seeds. Oops, I meant the black oil sunflower seeds, not the striped kind. It is big, over 12".